A heading is a title placed at the beginning of a passage to provide a concise description of its content. In books, it refers to the titles given to each segment of the text according to chapter, section, paragraph, etc. In newspapers and magazines, a heading, or headline, could refer to the opening words used as a title at the beginning of articles. Because headings in books are added according to the structure of the main text, they are often categorized into levels and called banner headings, crossheadings and subheadings. Headings are distinguished from the main text by the font, text size and where they are placed, etc. Mincho and Gothic fonts are frequently used for Japanese text. It is common to set the minimum font size at the size of the main text and use larger text as you move up the levels. 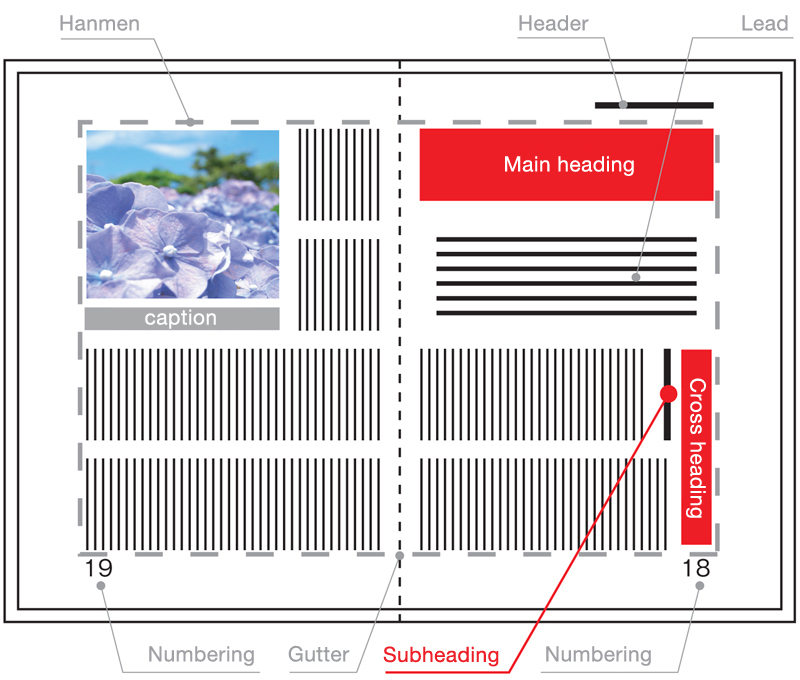 Quite often, a larger space is set aside for headings. This space may be equivalent to the size of several lines of the main text and is intended to make the heading stand out. When chapters, sections and paragraphs begin from the same point, specifying the space and positions of the headings can become complicated. When a heading ends up on the last line of a page (usually the last line of an odd page in an opened book), the heading is generally moved to the top of the following page.